Whole blood consists of red and white blood cells, as well as platelets suspended in a liquid referred to as blood plasma. According to the American Red Cross, plasma is 92% water and makes up 55% of blood volume. The permeability of blood plasma is equal to 1. Red blood cells make up slightly lower blood volume than blood plasma — about 45% of whole blood. As you probably already know, these types of blood cells contain hemoglobin, which in turn consists of iron that helps transport oxygen throughout the body. The permeability of red blood cells is slightly less than 1 (1 – 3.9e-6). Or to put it in words, red blood cell particles are diamagnetic. Lab-on-a-chip devices (LOCs) are very small (picture an area in the millimeter-centimeter range) microfluidic devices consisting of flow channels that perform one or more lab functions on a single chip. LOCs are frequently used in medicine and research for analyzing samples of blood, thanks to the reduced risk of sample contamination made possible by the ability to collect and study very small samples. Due to their aforementioned magnetic properties, red blood cells may be separated from the plasma using a magnetophoretic approach. If we were to subject the LOC channel to a magnetophoretic force, we could control where the red blood cells and the plasma go within the channels. In other words, because the red blood cells have different permeability, they can be separated from the flow channel. LOC: Two neodymium permanent magnets and a flow channel with three outlets and an array of soft iron patches. The magnetophoretic force of the magnets will push the blood cell particles inward. 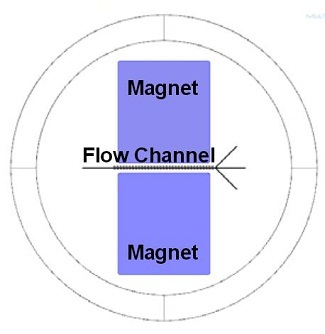 Combined, the drag force and the magnetophoretic force will simultaneously push the particles toward the center and through the main channel, bypassing the two channel branches. Meanwhile, the blood plasma, which has a permeability of 1, is not affected by the magnetic field and simply travels along in the direction of the drag force. This ultimately leads one third of the plasma to flow through each of the channels, while all of the red blood cells are concentrated in the center channel — providing us with a high enough concentration to study. Red blood cell separation: An LOC device, zooming in on the flow channels. The red blood cell particles travel in the center channel. 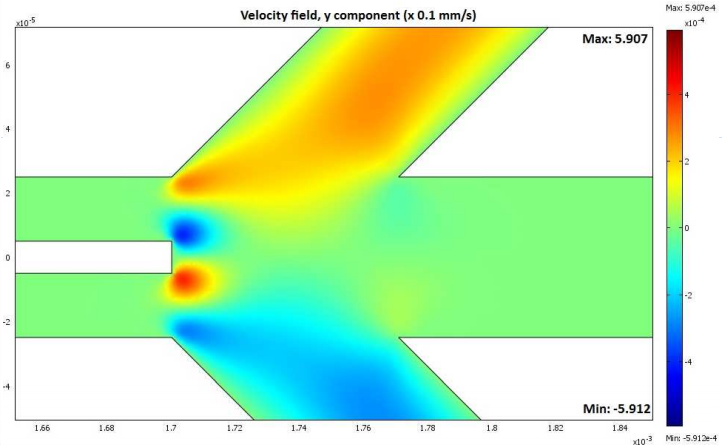 The above simulation was created with the COMSOL Multiphysics® software together with the AC/DC, Microfluidics, and Particle Tracing modules. Editor’s note: The following section was added to this blog post on 09/06/2016 to include related simulation research. Using a similar method to approach noninvasive prenatal diagnosis (NIPD), a group of researchers at the Polytechnical University of Turin and Heriot-Watt University designed an LOC device to separate fetal cells from a mother’s blood. Since fetal nucleated red blood cells have the same magnetic properties as an adult’s red blood cells, these two types of cells can be separated from the rest. A second separation could then differentiate the nucleated and anucleated cells. The LOC device’s fluid velocity field in the vertical (y-component) direction. 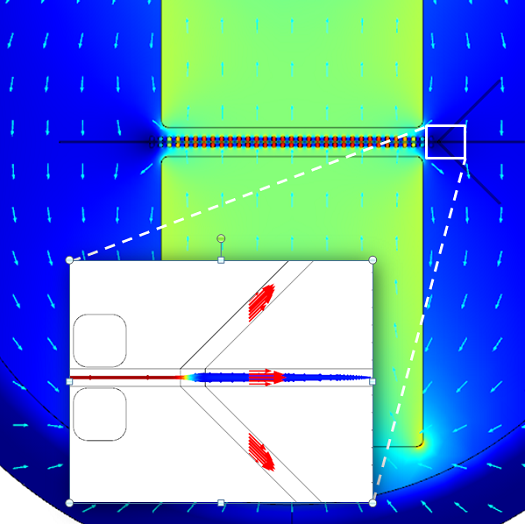 Image by Giuseppe Schiavone, Deirdre M. Kavanagh, and Marc P.Y Desmulliez and taken with permission from their COMSOL Conference presentation. To verify their design, the researchers used COMSOL Multiphysics to create a model of the LOC device. 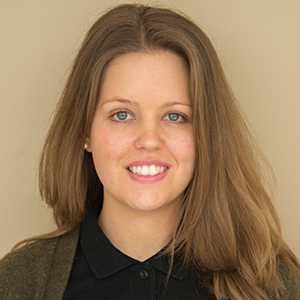 By simulating the magnetic field distribution and fluid velocity field, they were able to correctly size the device for efficient and reliable cell separation. The team then used particle tracing to calculate the motion of the cells injected into the microdevice. This enabled them to determine the required cell separation length and, in turn, the length of their LOC device.